Mother Meera is a modern Hindu philosopher and guru who directs devotees on the path of enlightenment. 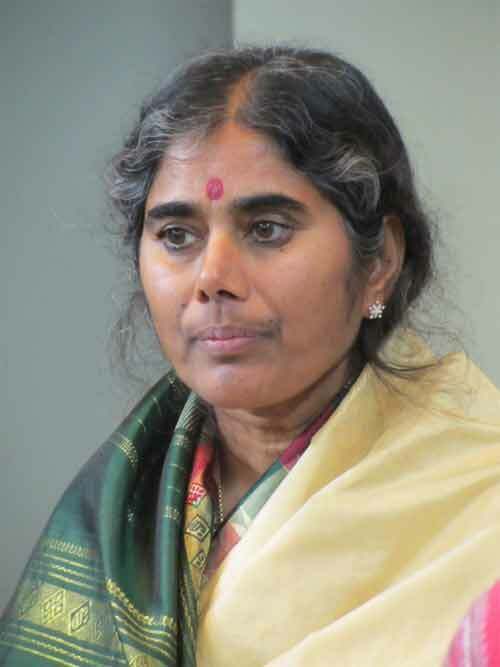 This is a collection of quotes and teachings of Mother Meera. The sources are mostly magazines, internet, websites and online audio videos. People can help by receiving the Light and letting it change them. They should be peaceful and harmonious. To be harmonious means to be whole; to love others and to enjoy your life; to respect the dignity of others; to know yourself and your difficulties and to work with them so you become free and are able to help others. Humility brings harmony. A humble person is integrated with reality and is happy, because humility brings happiness. When you are open, the Divine can pour itself into you. When you are changed, the Divine can work through you. People suffer a great deal in life without knowing why. When there is Grace, you are helped to know why and to change. The greatest pain is ignorance. When the pain is clear, you can find its source and can change. Realization is absolute feeling, absolute freedom to love everything and to know everything. It is the unrealized man who is like a stone; the realized man is like a bird, all life and true energy and beauty. Any pain that comes is to make you understand the nature of joy more deeply and bring you into joy. When you know that you are eternal you can play your true role in time. When you know you are divine you can become completely human. When you know you are one with God you are free to become absolutely yourself. In silence one can receive more because all one's activities become concentrated at one point. There is only one real rhythm; in silence you hear it. When you live to the rhythm of this silence, you become it, slowly; everything you do, you do to it. All paths lead to the same goal, that is, to realize the Divine. When you give something which you love most and you offer it to God or to your master or to your family, then you have detachment from material life and at the same time, your love and devotion are growing towards God. Try to know the Paramatman (the Supreme Self) in the greatest, then there is no ego. Soul has no language. Language can point towards the Truth, but cannot uncover It. People can believe what they like. For me there is no difference. All rivers flow to the sea. It does not matter how you live – you can lead a normal life; it is not necessary to consecrate your whole life to the Divine. But whatever you do, try to remember the divine as much as possible. Your only aim should be to aspire always to God. People put too much emphasis on realization. In my view it will take lifetimes. Instead, it is better to love and remember the Divine. If you surrender to Him truly, it will no longer be you who does the work but God who does it through you. Do the practice for the sake of the Divine, not for the sake of liberation. The greatest pain is ignorance. When the pain is clear, you can find its source and can change. Be like a child – clear, loving, spontaneous, infinitely flexible and ready each moment to wonder and accept miracle. There are so many meditation techniques. Generally they confuse people. Quite often they increase people’s spiritual pride instead of destroying it. The proud man is far from God. You have to be very careful. The best way is to remember the Divine in everything and to offer everything to the Divine. People are too active and rarely sit quietly. In silence one can receive more because all one’s activities become concentrated at one point. The power of the Divine works in the silence and will change things according to your aim and what you ask for. Paramatman is infinite light and the source of all, of being, knowledge, bliss, of peace, of each atman, each soul. Japa is the repetition of the name of that in which we believe. Japa is not simple words - each divine name is full of divine vibrations. These surround us and protect us and penetrate both our bodies and our whole inner being. Remembrance of the divine name gives immediate peace and happiness and turns us from the worldly to the Divine. There is no special and limited time for japa. It is very good to do japa all day. If this is not possible then remember whenever it is possible. We can practice japa during all activities. It is easier to remember when we do physical work without mental work. This japa helps us to purify our consciousness and make our sadhana easy.